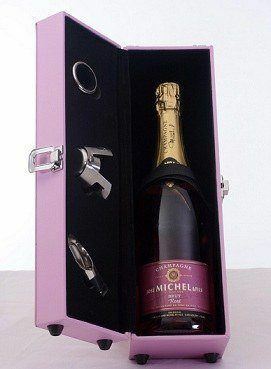 Champagne Gift box in faux leather with accessories comprising of a Champagne stopper, drip collar and pourer with Jose Michel Rose Champagne. If this is a special gift you can pick the delivery date after you checkout. Jose Michel pink Champagne. In the heart of the Côte des Blancs, a small 21 hectare property producing some 180,000 bottles a year. José Michel and his son Bruno run it with the greatest of care. The Pinot Meunier provides freshness and fruit. The non-vintage rose is ideal for all kinds of celebrations, but the vintages Club and Père Houdart should be kept.